Specialty: Worlds largest computer company & systems integrator. 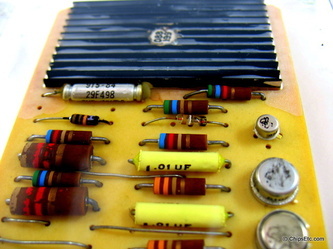 Manufactures & sells hardware & software for Personal, Business & Server computers. 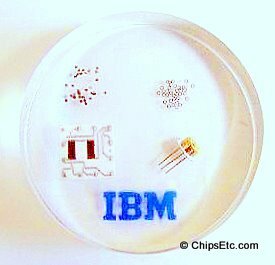 Designs and manufacturers microelectronics (will become chip designer only by 2015, with manufacturing to be done by Global Foundries). 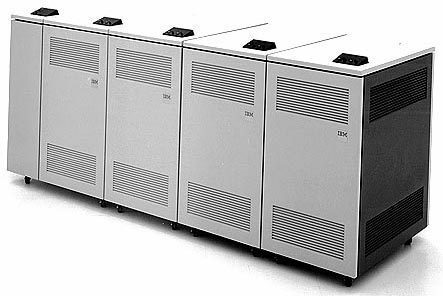 IBM 2400 Series magnetic tape drives were state of the art technology allowing each 2400' tape reel to store up to 20MB of capacity using 9-track storage at 800bpi (bits per inch). 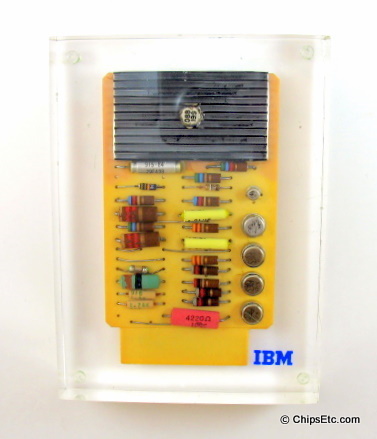 This was IBM's first 9-track model and the first tape drive capable of recording EBCDIC (8-bit) or ASCII (7-bit) information. 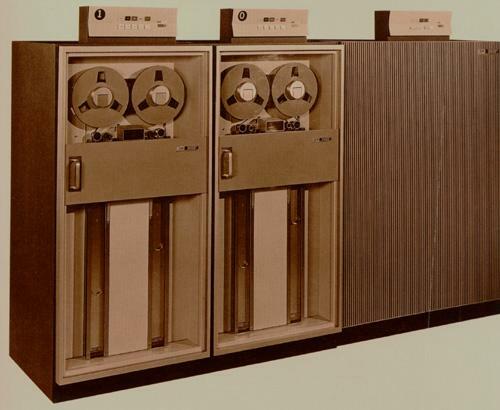 These units were used for data storage with the IBM system 360 mainframe computer system. This is an SMS card embedded inside a Lucite paperweight. SMS came before the IBM System/360 and its Solid Logic Technology (pre-1964) in the late 1950's when SMS was hot stuff -- this was premiere circuit packaging technology post vacuum tubes and pre integrated circuits (and pre hybrid IC technolgy like the IBM SLT). 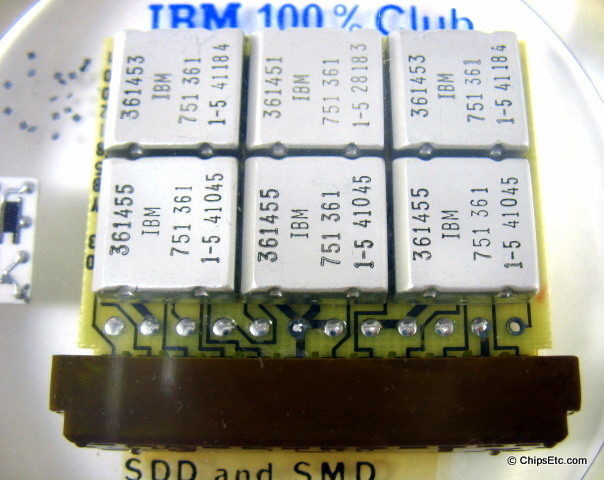 The Standard Modular System (SMS) was a system of standard Transistorized circuit boards and mounting racks developed by IBM in the late 1950's, originally for the IBM Model 7030. 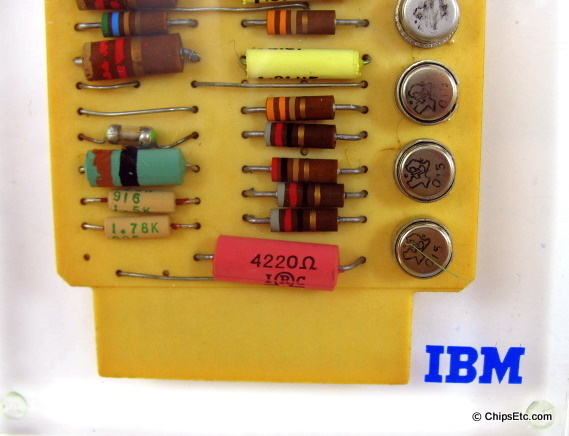 They were used throughout IBM's second generation computers and peripherals, including its first transistorized calculator the IBM 608. 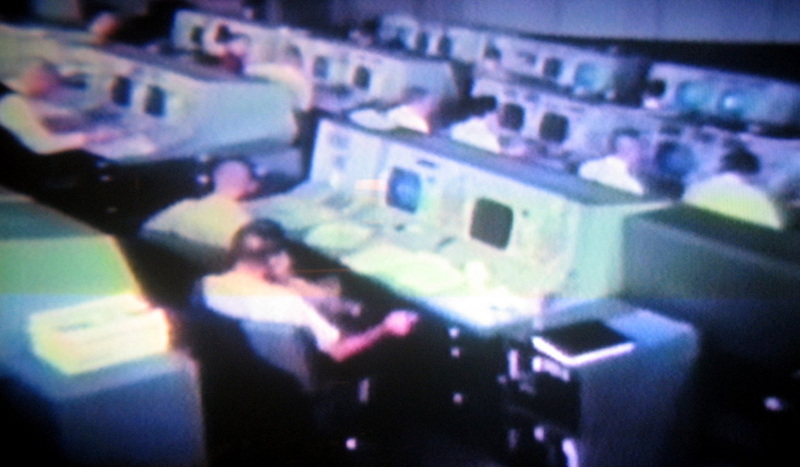 IBM's SMS technology was superseded by Solid Logic Technology (SLT) introduced with the System/360 Computer in 1964, however they remained in use with legacy systems through the 1970s. 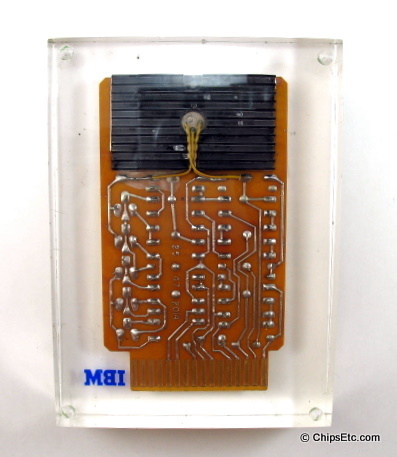 The vast majority of SMS cards would have been low power logic circuits, forming part of the central processor of the machine they came from. 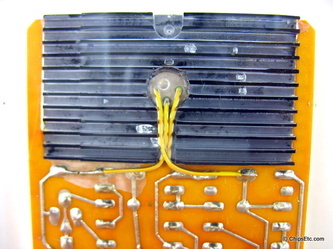 SMS cards were constructed of individual discrete components mounted on single sided paper-epoxy printed circuit boards. Single width cards were 2.5 inches wide by 4.5 inches tall by 0.056 inches thick, with a 16 pin gold plated edge connector. 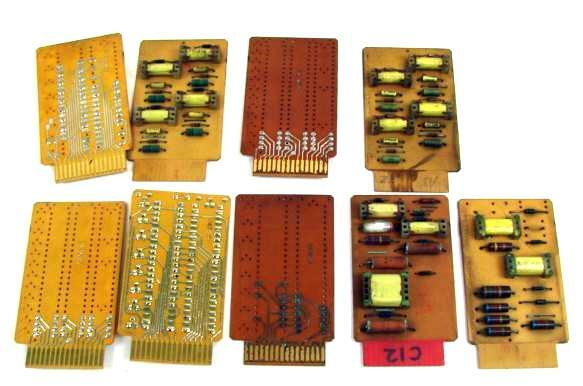 Double width cards were 5.375 inches wide by 4.5 inches tall, with two 16 pin gold plated edge connectors. An SMS card would typically have 3 to 6 germanium transistors and 15 or so resistors, plus half a dozen capacitors and diodes. 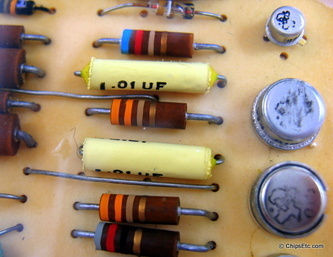 A board might contain a flip-flop or a few simple gates, so each board roughly corresponds in function to a Small Scale Integrated (SSI) circuit of the early 1970's. Some card types could be customized via a "program cap" (a double rail metal jumper bar with 15 connections) that could be cut to change the circuit configuration. 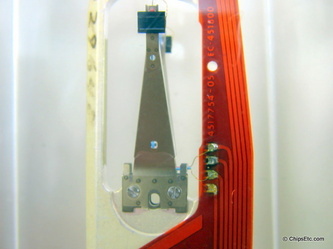 Card types with a "program cap" came pre-built for the standard configuration and if a Customer Engineer needed a different configuration in the field he could make additional cuts as needed. This feature was intended to reduce the number of different card types a Customer Engineer had to carry with him to the customer's site. When SMS was originally developed in 1955, IBM anticipated a set of a couple hundred standard card types would be all that would be needed, making design, manufacture and servicing simpler. 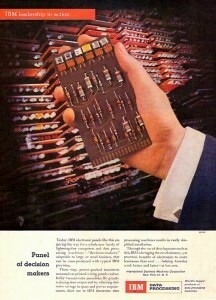 Unfortunately that proved far too optimistic as the number of different SMS card types soon grew to well over 2500. Part of the reason for the growth was that multiple digital logic families were implemented (ECL, RTL, DTL, etc.) as well as analog circuits, to meet the requirements of the many different systems the cards were used in. 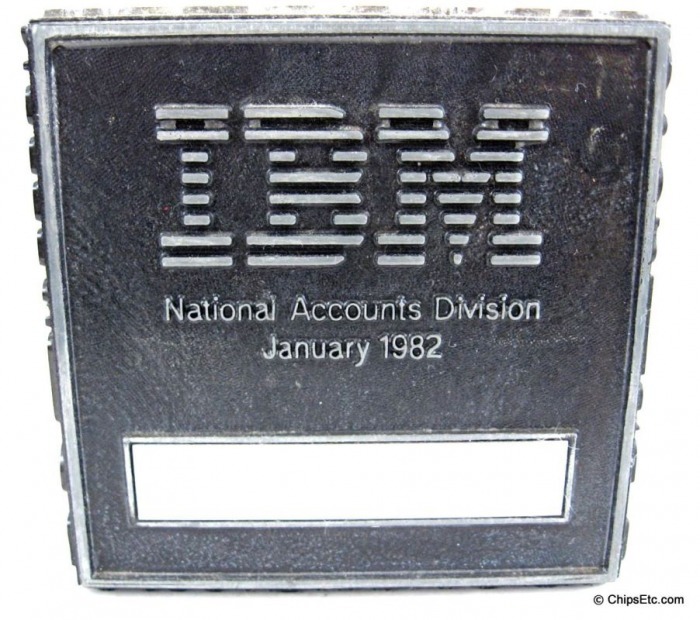 IBM's Information Records Division (IRD) was formed in 1966 out of IBM's Supplies Division which was responsible for providing punched cards, magnetic tapes, ribbons, microfilms, paper forms, and other supplies for use with IBM's data processing machines. 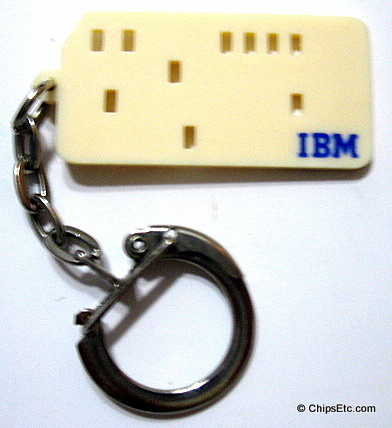 This promotional plastic keychain from IBM is a miniature version of their famous computer punched card. 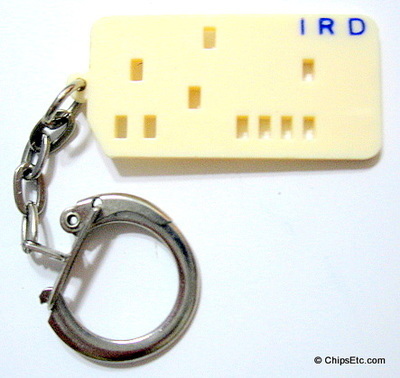 The front of keychain has the IBM logo, on the back it has the IRD logo. 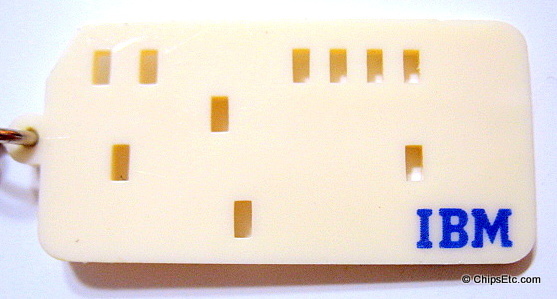 Punched Card measures 1.5 inches long. In March 1975 IBM's office products division announced a new line of dictation equipment offering exclusive user benefits. A modular input processing line, the IBM 6:5 Cartridge System provided simplified operation and up to 5 hours recording time. 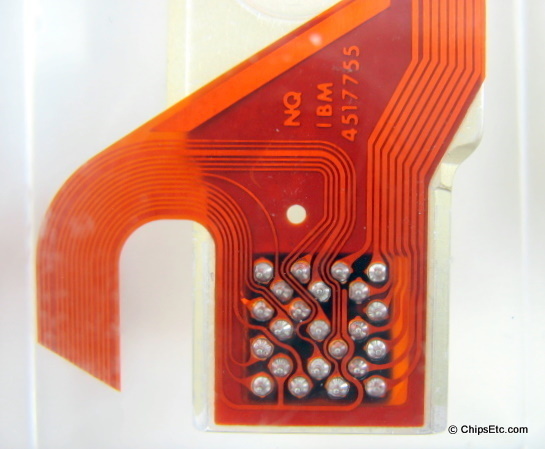 The main feature of the system is a cartridge that contained up to 25 magnetic discs which held 6 minutes of dictation time each and allowed simplified work distribution. 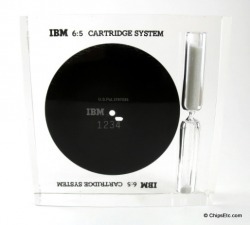 This Lucite paperweight contains a single IBM magnetic disc from the 6:5 cartridge system and also a 6 minute hourglass for salesman to show how long each disc could record for. 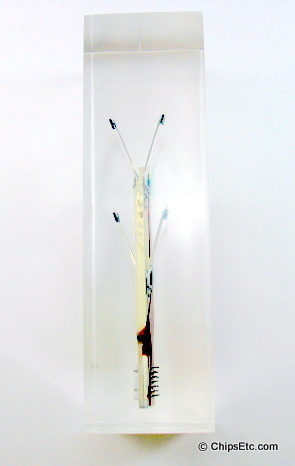 Paperweight made by Unique Canada. Measures 4 1/2" x 4 1/2" x 1 " thick. 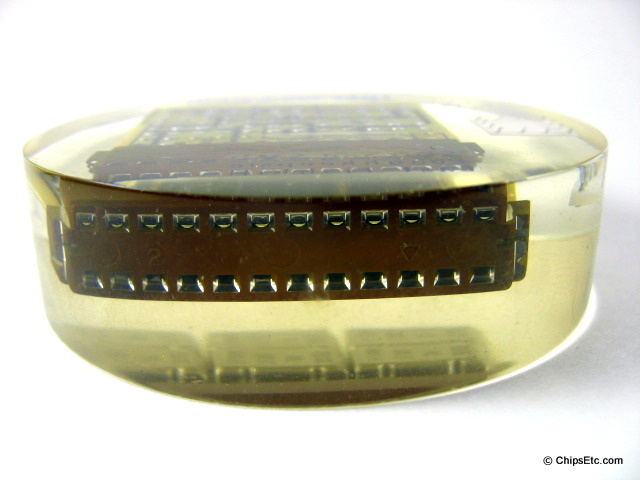 This is a clear Lucite paperweight with actual Disk read/write heads from an IBM 3370 Direct Access Storage Device (DASD). 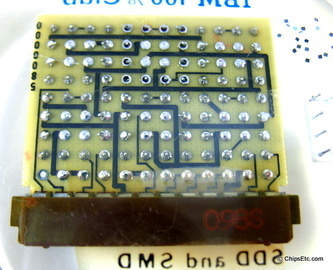 This paperweight was most likely a salesman's demonstration item. 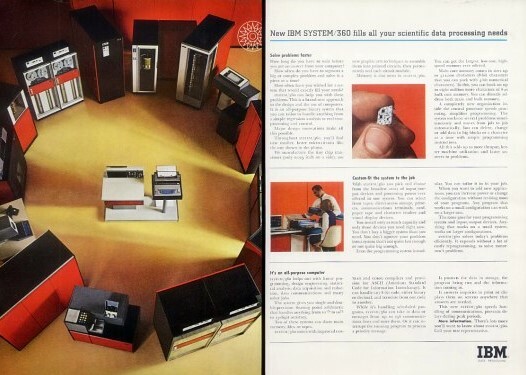 IBM's "New File Project" introduced the IBM 3370 Direct Access Storage Device in January 1979 for use with its IBM model 4331 and 4341 Processors, and for the System/38 mid-range computer. 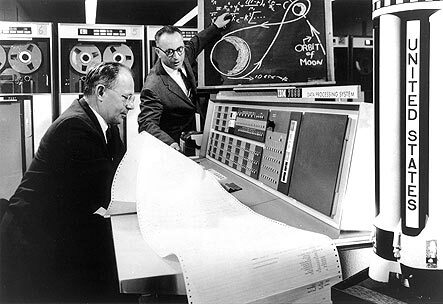 It had seven fixed 14" (360mm) disks, and each unit had a capacity of 571.4 Megabytes. Average seek time was 20 milliseconds and the nominal data rate was 1.859 megabytes per second. 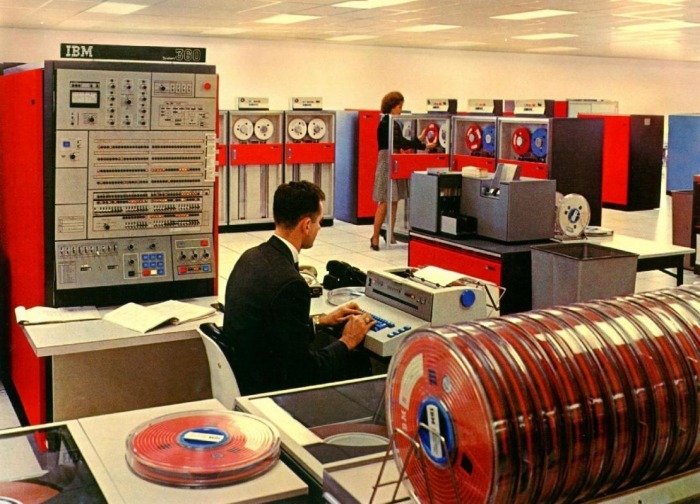 The IBM 3370 was the first Hard Disk Drive (HDD) manufactured that used thin film head technology (Work on thin-film head structures was started in IBM's Thomas J. Watson Research Center in Yorktown Heights, N.Y., in the late-1960s.) The 3370 used a fixed block architecture and was the first HDD to use 2,7 encoding. IBM officially the Model 3370 in august 1986. This is an IBM clear Lucite paperweight with an actual IBM canned, three-lead transistor and four ferrite (ceramic) core memory "doughnuts" in it. 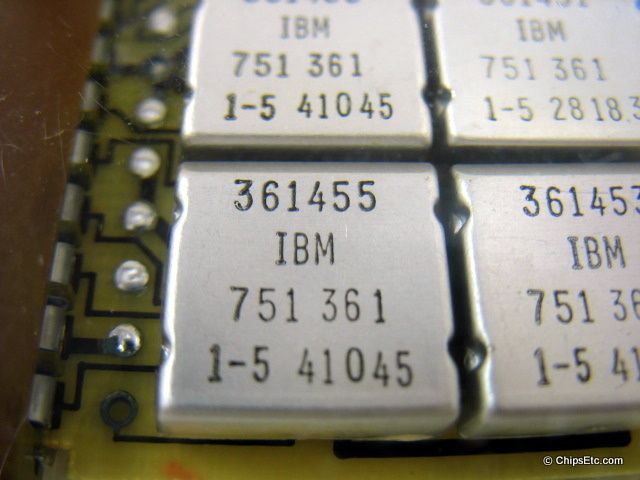 IBM's model 1620 used core memory as well as some previous computer models throughout the 1950's. 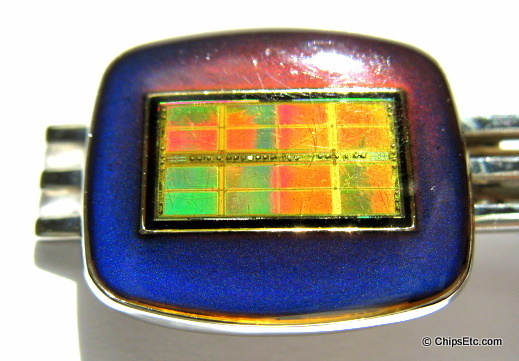 Magnetic Core Memory was an early form of RAM (random access memory) that used very small magnetic rings (known as cores) that were made of ferromagnetic ceramic (Ferrite). 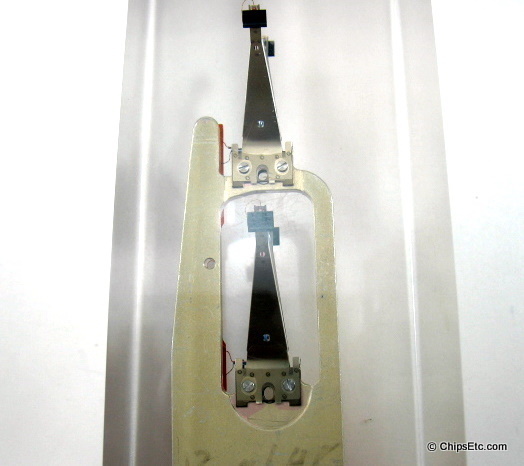 Fine wires are threaded through the cores to enable the cores to reflect a stored value of 0 or 1 depending on the polarity of the magnetic field they are holding. Lucite paperweight from IBM has an actual IBM gold and ceramic Ceramic Flat Pack IC chip that is typical of the types of Military Grade Integrated Circuits that were used in the IBM model 7090 Saturn flight simulation computer for the NASA Apollo moon missions. 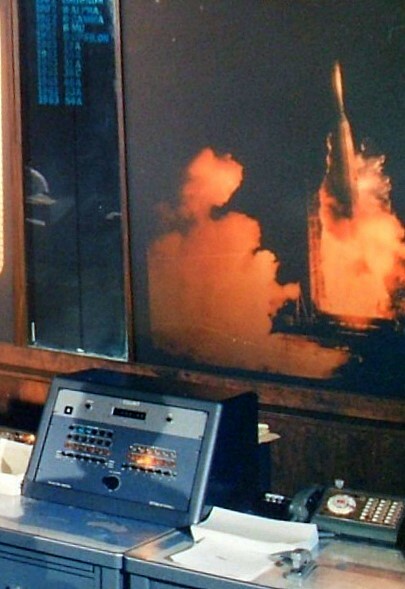 Illustrated on the paperweight are the Saturn V moon rocket at launch, and three computer personnel overlooking an IBM model 7090 Saturn flight simulation computer with an IBM magnetic tape storage unit shown behind them. 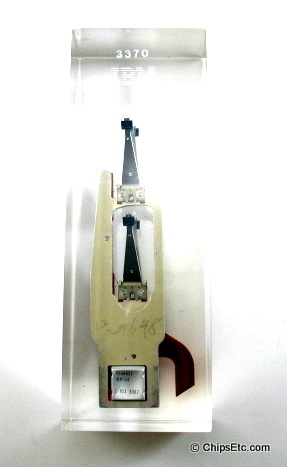 Measures 2.75" x 3.75" x 1" thick. 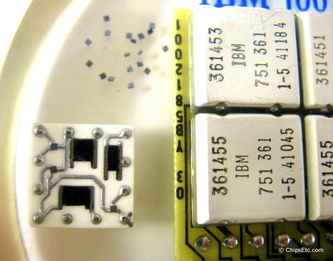 Light blue Lucite block features capped and un-capped IBM SLT logic chips from the IBM system 360 computer. 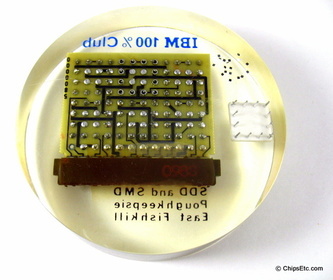 This clear Lucite round token contains various IBM System 360 computer technology components including an actual IBM SLT chip, canned transistor, core memory donuts and loose transistor chips. 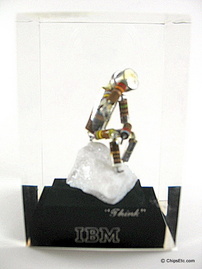 This creative Lucite IBM paperweight features Rodin's "The Thinker" as depicted by IBM using Transistors and Resistors as sculpture. 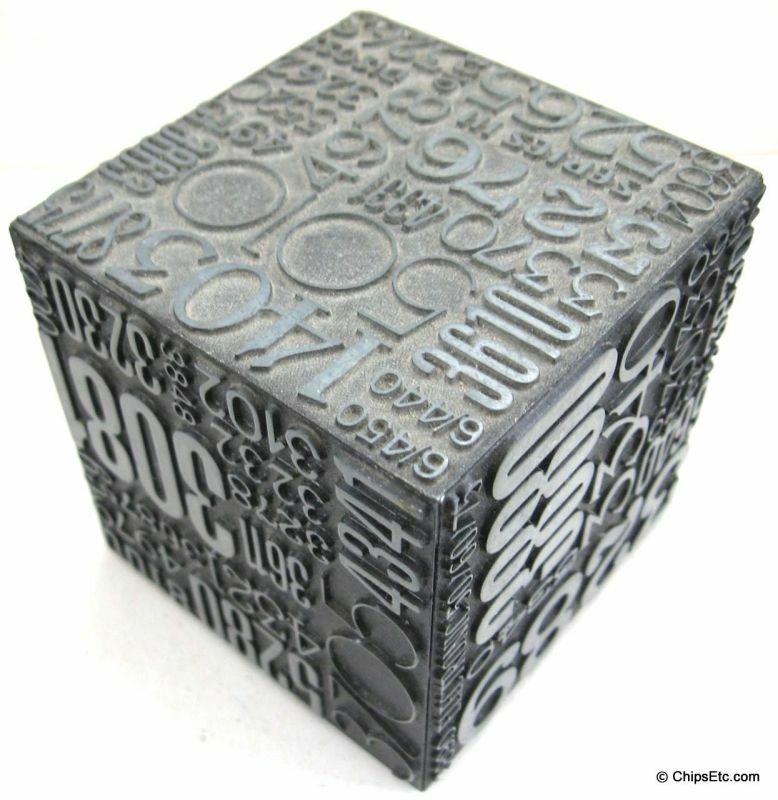 The black base features the famous IBM "THINK" motto. 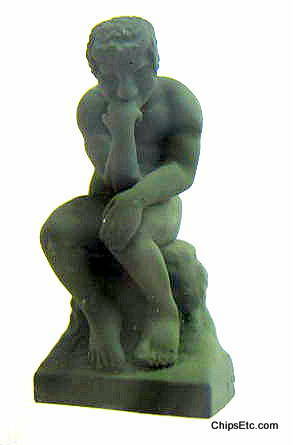 The "THINK" motto was ubiquitous within IBM offices and factories throughout the world by the 1930s. 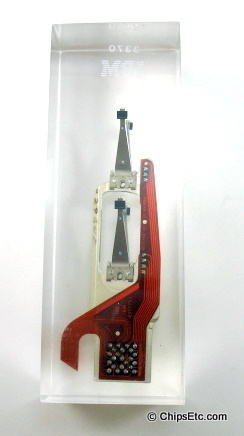 This actual item was displayed as part of the "Silicon City: Computer History made in New York" exhibit at the New York Historical Society museum during 2015 - 2016. 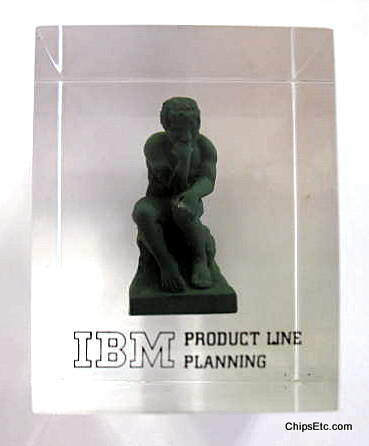 This Lucite paperweight from IBM also features features Rodin's "The Thinker". 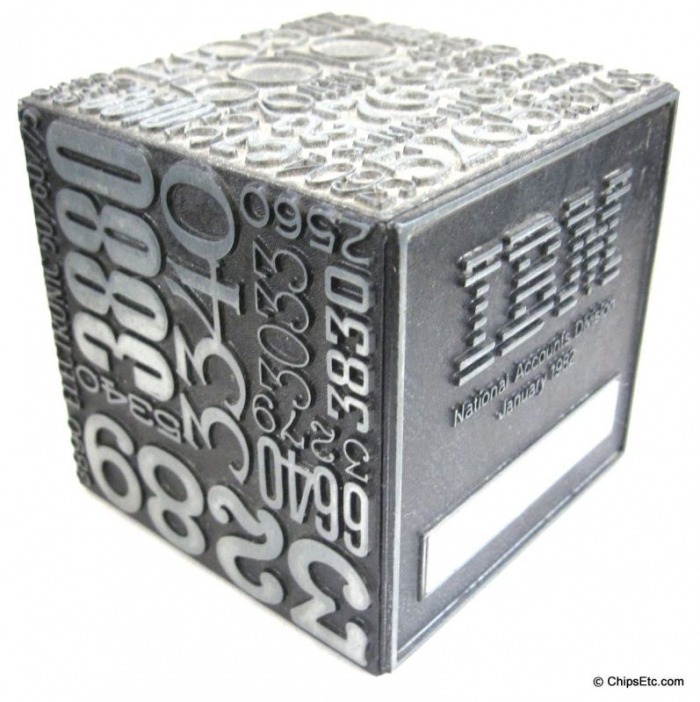 It was created for promoting IBM's Product Line Planning Department. 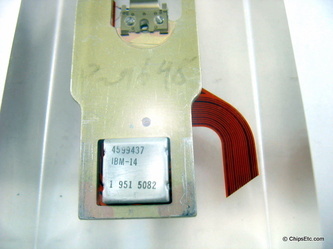 This is an IBM SLT (Solid Logic Technology) Processor Module that would have been used in an IBM System 360 mainframe computer. 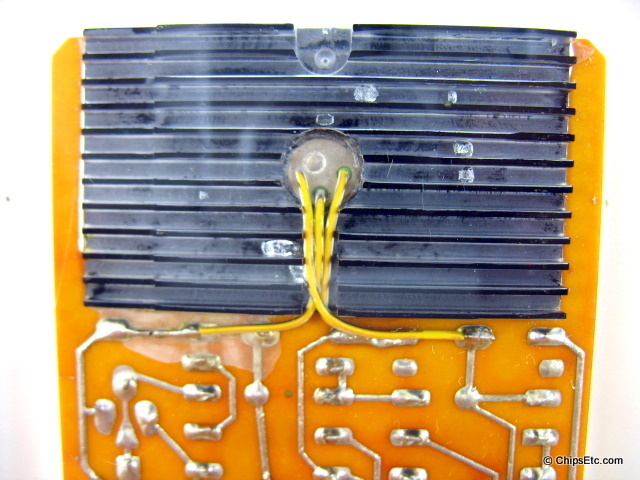 This module contains five SLT chips mounted on a connector card, one of the SLT chips has it's cover removed so the circuity and components can be viewed. Clear Lucite paperweight measures 2 7/8" Diameter x 3/4" thick. 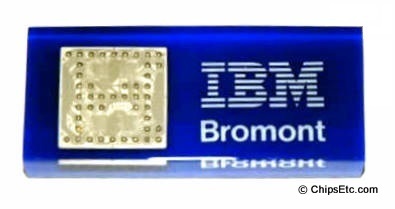 This Lucite keychain has an actual 16MB RAM chip that IBM manufactured at it's Bromont Plant in Quebec Canada. Silver Toned IBM tie Clip showcases an actual IBM 1 Megabit DRAM memory chip embedded inside. This unique "mood" piece is made of liquid crystals with a protective coating. 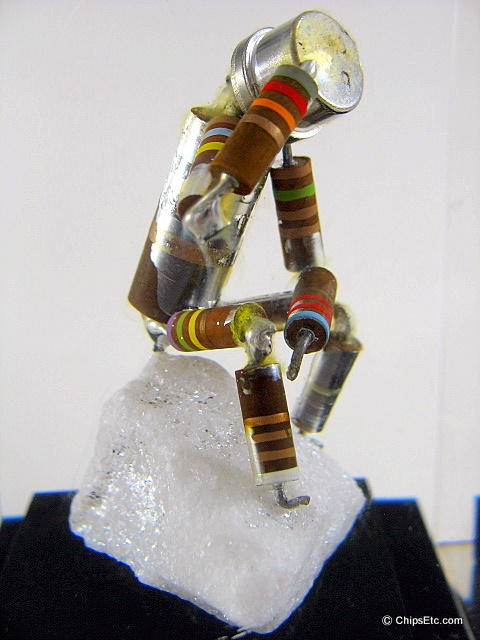 The crystals respond to changes in temperature by twisting which changes their molecular structure and how they reflect light. The color of this piece changes from blue to green to brown depending on the wearers mood. SAMOS (Silicon and Aluminum Metal Oxide Semiconductor) technology. 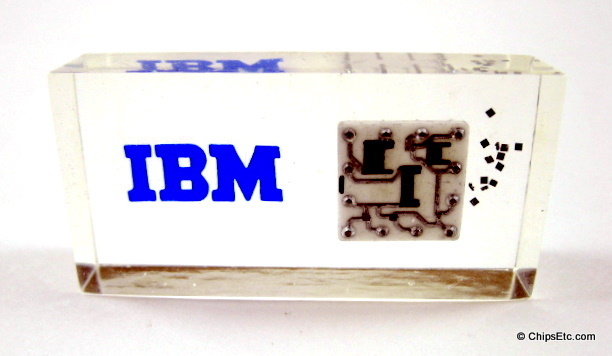 This IBM computer memory chip, 3/8-inch long, stored more than one million bits of information. 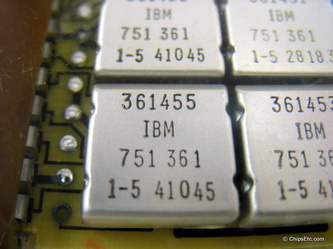 IBM was the first to develop and mass-produce chips of this density. 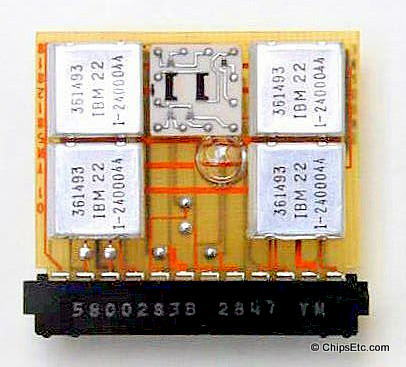 At the beginning of 1987, the only such chips operating in the industry were in the IBM 3090, System/38 and System/36 computers and in the IBM 3880 disk "cache" control unit. (VV3131) . 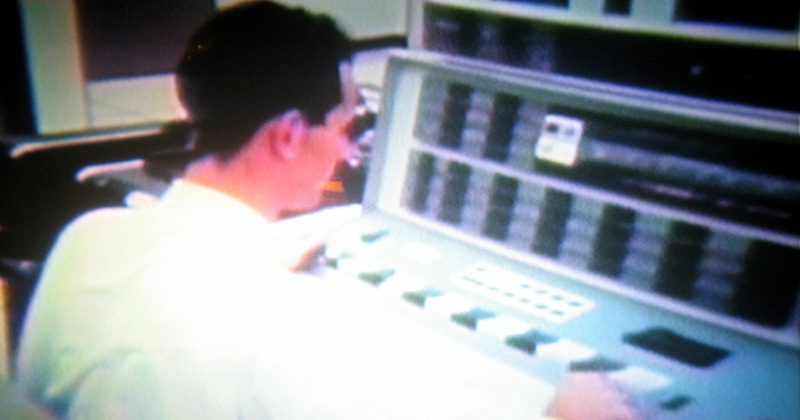 The most powerful IBM computer system of its time, the 3090 high-end processor of the IBM 308X computer series incorporated one-million-bit memory chips. Although not one of the more well-known mainframes, when the IBM 3090 was announced in 1985 it offered a solid advancement on the System/370 architecture that not only continued the improvements in speed, but also increased the number of processors while giving them vector processing options. 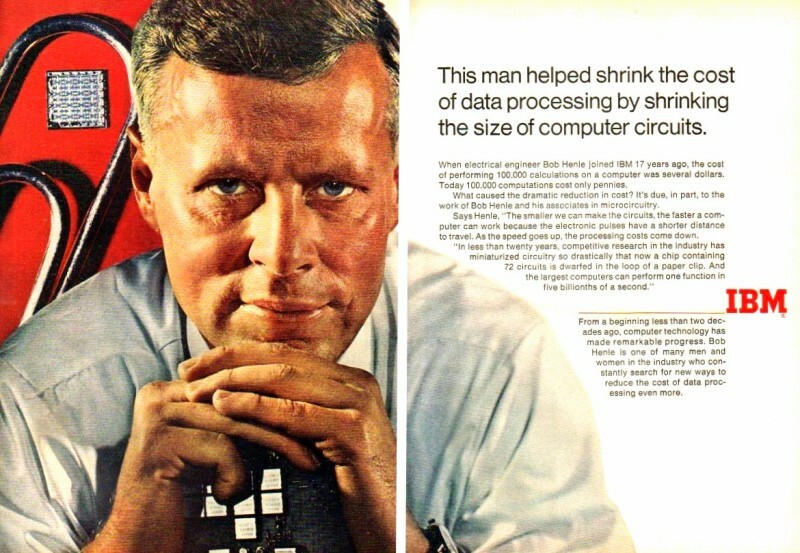 Initially only available as Model 200 and Model 400 (the first number denoted the number of processors), the line was expanded dramatically in its short four years of existence. 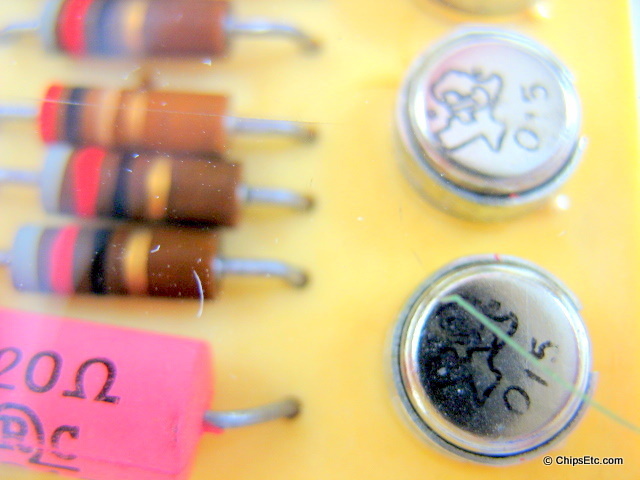 It was replaced by the ES/9000 line. 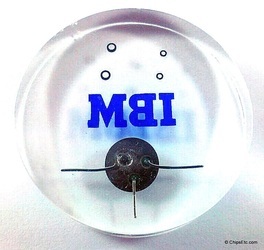 Measures 2" wide and is stamped on the back with a maker's mark and "IBM". 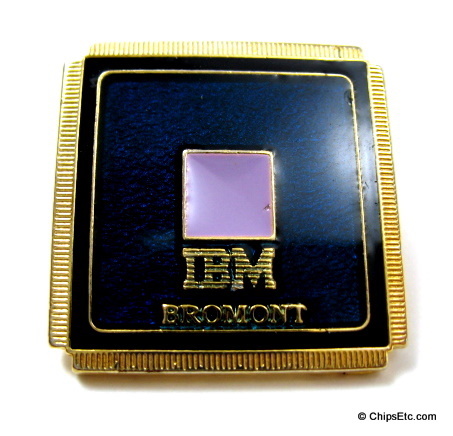 IBM's Bromont (Quebec) plant was built in 1972 and is the largest IBM semiconductor assembly and testing facility in the world. It is also the sole IBM plant in Canada. Every system manufactured by IBM contains at least one component produced in Bromont. 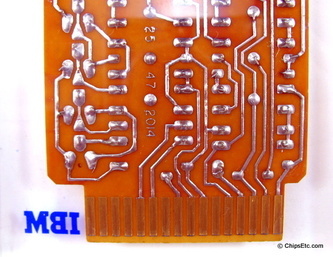 Non-IBM products incorporate components from Bromont - the Microsoft Xbox 360, the Sony PlayStation 3 and the Nintendo Wii all contain processors assembled and tested in Bromont. Enamel on steel Pin designed to look like a chip on a quad flat package with outer leads. 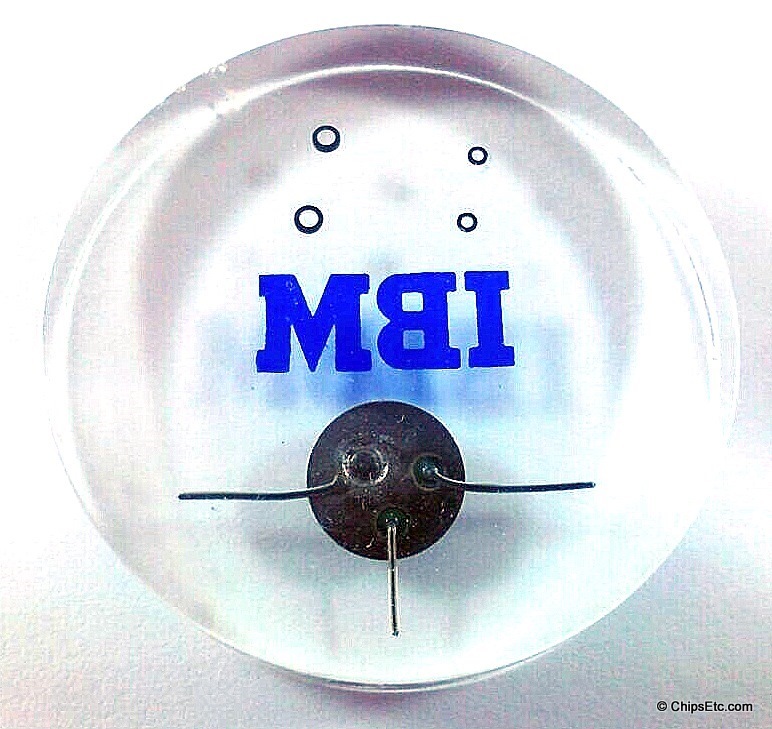 Clear Lucite with blue base features an actual IBM chip package made at it's Bromont plant and has the IBM logo. 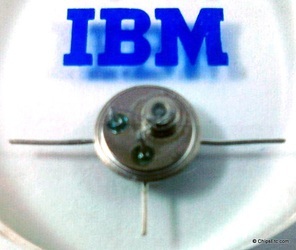 From IBM Essonne France Research and Manufacturing Facility, IBM experimented with the speed and power potential of CBL as an attractive practical approach to bipolar complementary transistor logic. 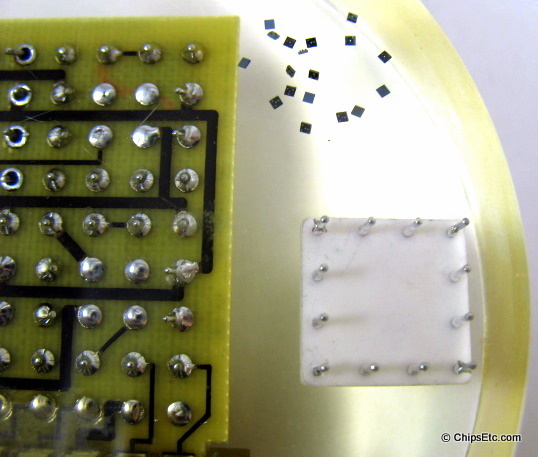 Enamel on brass plated Pin. 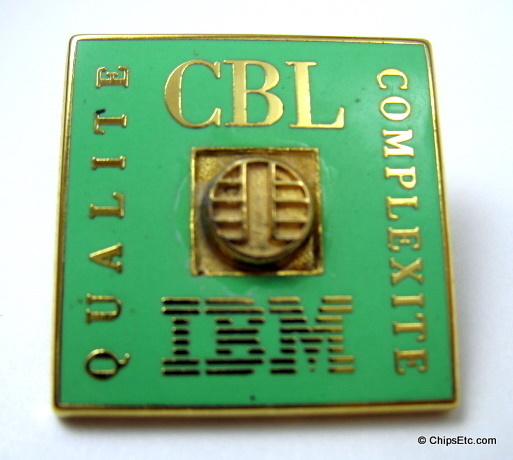 IBM's Advanced Bipolar Line (ABL) was a 323,000 sf class-10 clean-room used by IBM for manufacturing and development located in Essonne France. 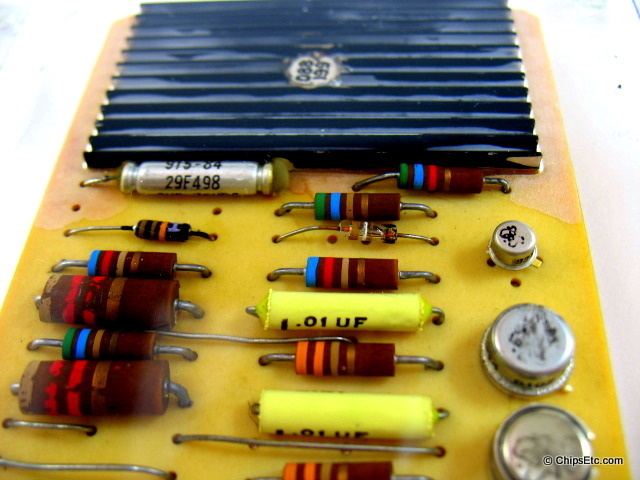 It was the largest semiconductor manufacturing facility in Europe in the 1980's and employed over 4000 workers. 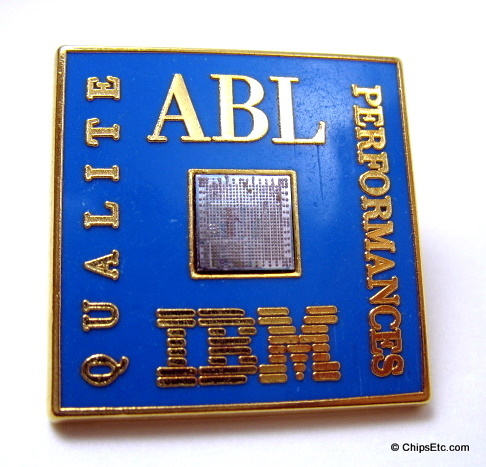 IBM's ABL plant produced the majority of the IBM system/360 boards and SLT chips that went into European computers during the 1960's. 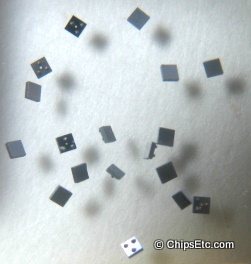 By 1982 the Essonne plant was turning out between 10 to 20 million VLSI logic chips per year. 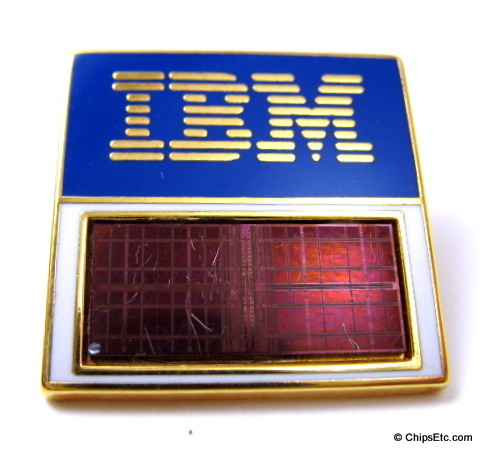 Enamel on brass plated Pin features a real IBM chip mounted in the center. 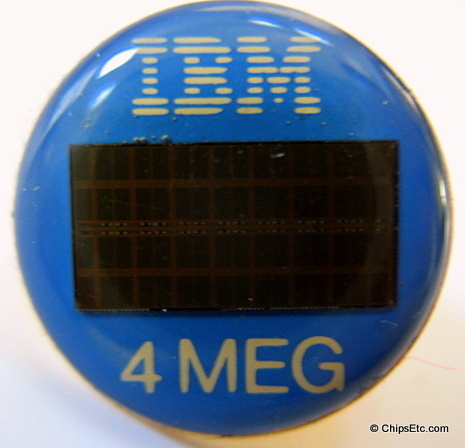 Clear stick on button features a real IBM 1 MEG memory chip embedded inside with IBM blue background. 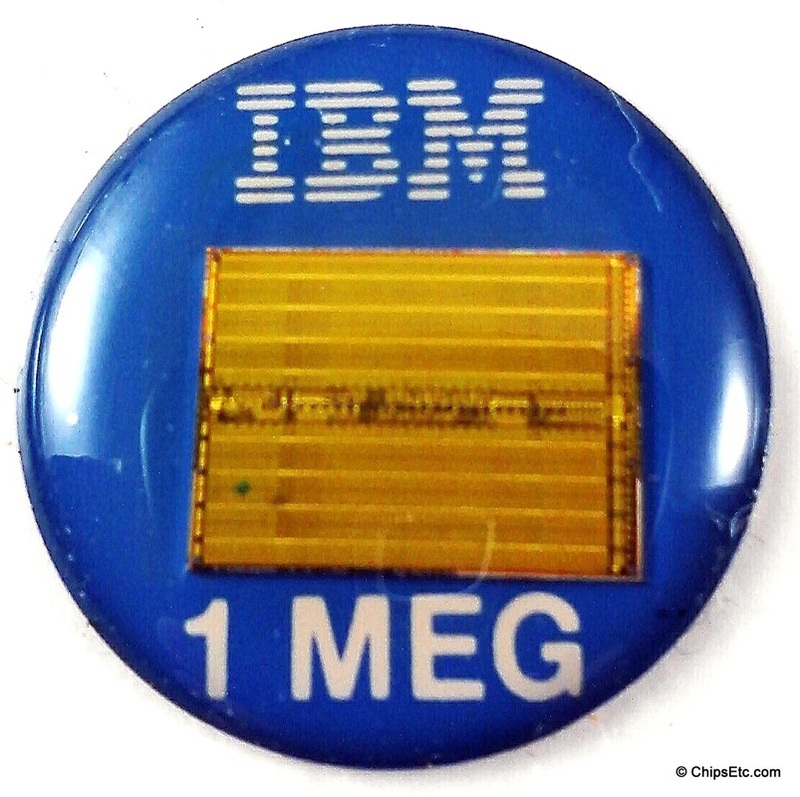 Item #963 similar but with smaller version of the 1 MEG memory chip. 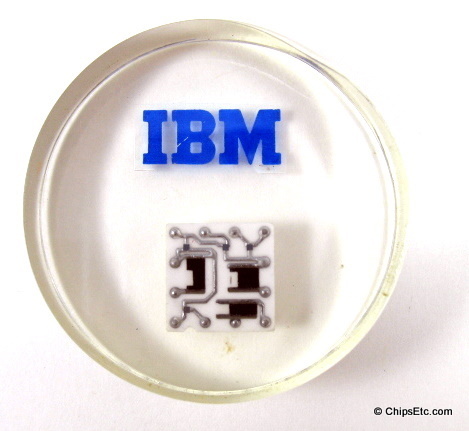 Another clear stick on button from IBM promoting their latest memory chips in 1989. 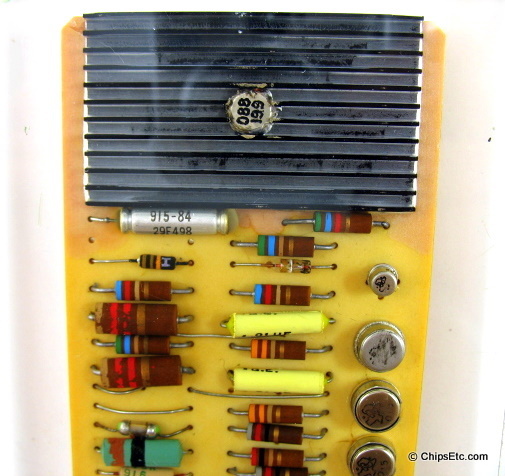 ​This one features an IBM 4 MEG memory chip. 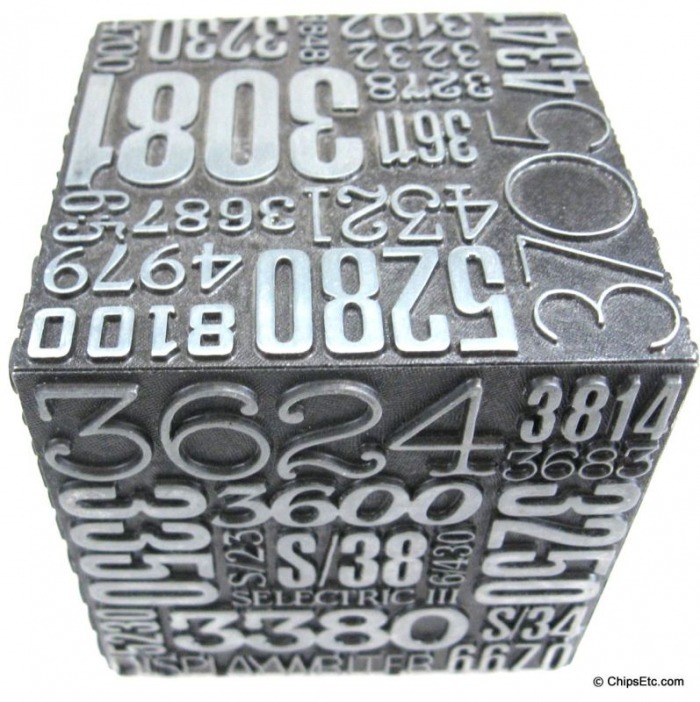 Pewter cube embossed with the model numbers of many of the IBM Data Processing units made for it's Data Processing Division (DPD) over the years. 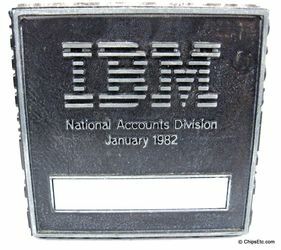 On December 3 1981, IBM announces that the Data Processing Division will be absorbed into the new IBM National Accounts Division (NAD) effective January 1982. The National Account Division's headquarters are established in DPD's office building in White Plains, N.Y. DPD's George H. Conrades becomes NAD's first president.The National Accounts Division sells directly to the largest companies in the United States. 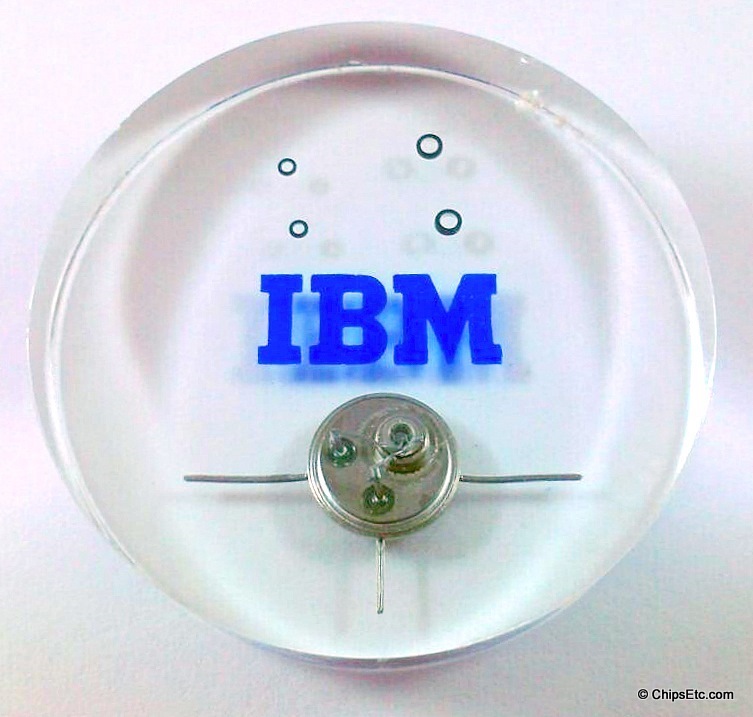 IBM's Quarter Century Club members are employees with 25 years or more of IBM service. In 1924, prior to the Computing-Tabulating-Recording Company being renamed the International Business Machines Corporation, Thomas J. Watson, Sr. declared all employees who had served with CTR for 25 years or more were to become members of the new Quarter Century Club. The purpose of the Club was to promote fellowship among members of this distinct group. 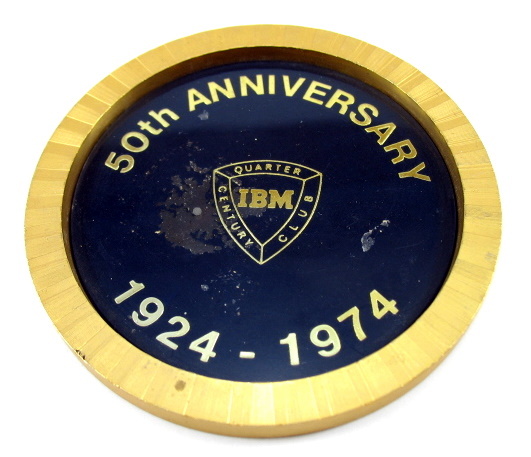 The Quarter Century Club held its first meeting in Atlantic City, New Jersey before IBM was created. 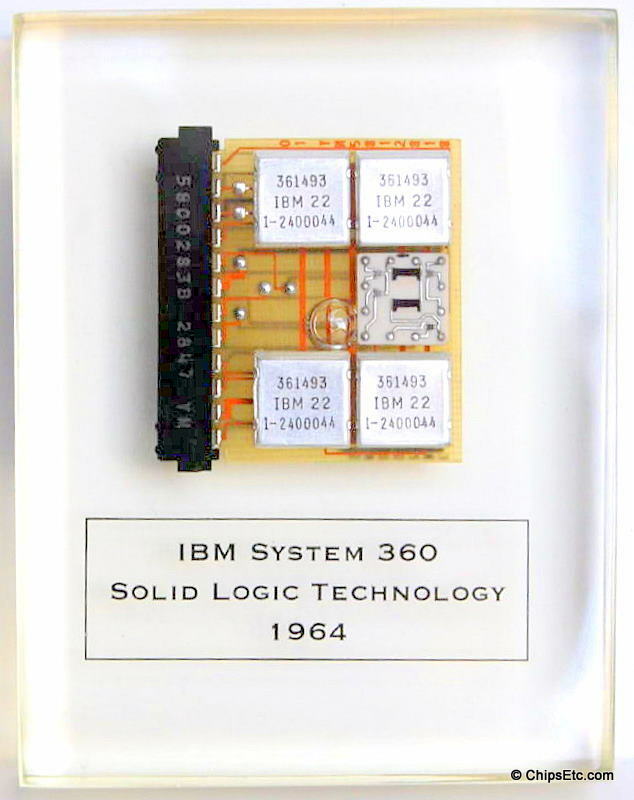 The Solid Logic Technology (SLT), introduced in 1964 by IBM in System/360, was the industry's first high-volume, automatic, micro-miniature production of semiconductor circuits. 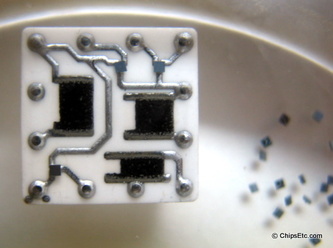 Mounted on 1/2-inch-square ceramic modules seen here, the SLT circuits were denser, faster and required less power than the previous generation of transistor technology. 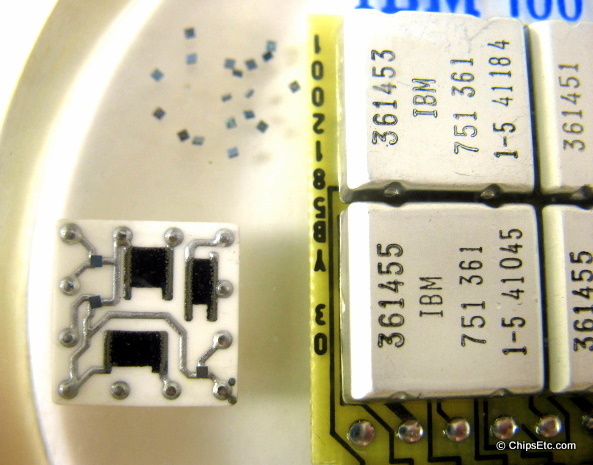 An IBM SLT Chip with multiple loose dice embedded in Lucite. 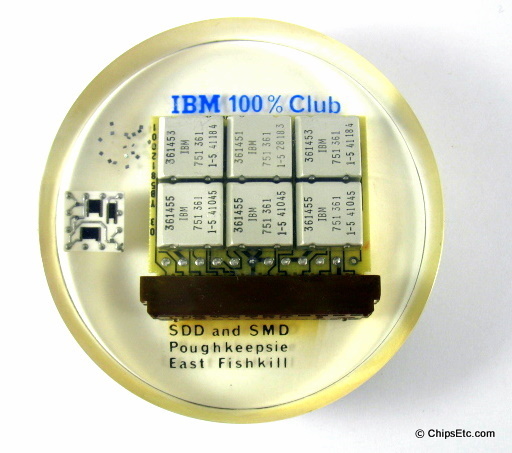 This clear Lucite paperweight features an IBM SLT Processor Module from an IBM System 360 mainframe computer. 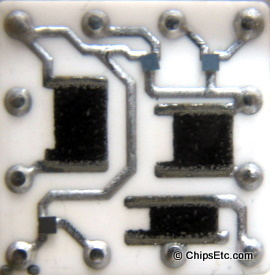 Also there are some loose chips and an uncapped SLT. 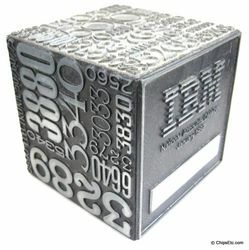 Every year IBM would recognize their sales representatives who have achieved or exceeded their sales quota by inducting them into the 100% Club. 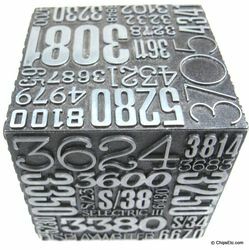 This paperweight would have been given to a limited number of 100% Club members. 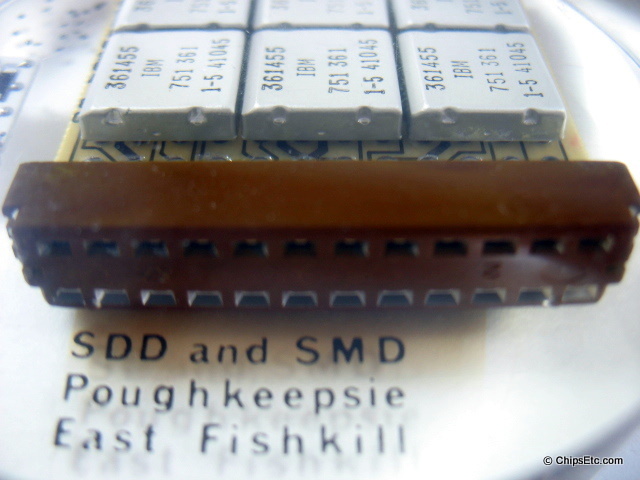 IBM's Systems Development Division (SDD) was located in Poughkeepsie N.Y. & the IBM Systems Manufacturing Division (SMD) was located in East Fishkill N.Y. Measures 2 7/8" Diameter x 3/4" thick. This clear Lucite round token contains an actual IBM SLT logic chip used in IBM System/360 mainframe computers and has 12-pins. 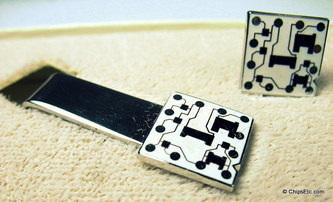 This a high quality three piece Tie Bar & Cuff Link set resembling IBM System 360 Computer "SLT" Solid Logic modules on polished mounts with white enameling. Comes with gray velor slip case. 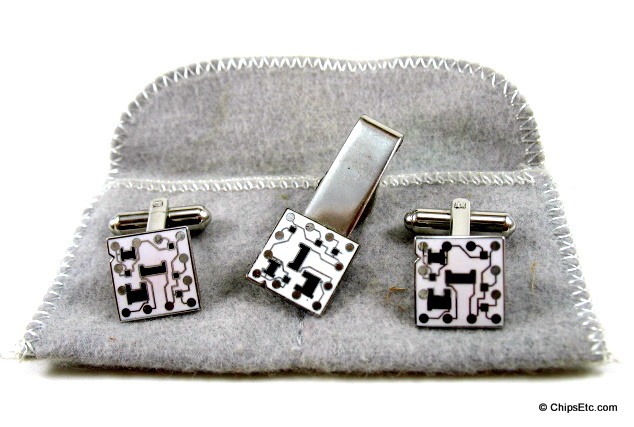 These Tie Sets were popular accessories with the IBM System 360 sales & office workers during the mid to late 1960's. 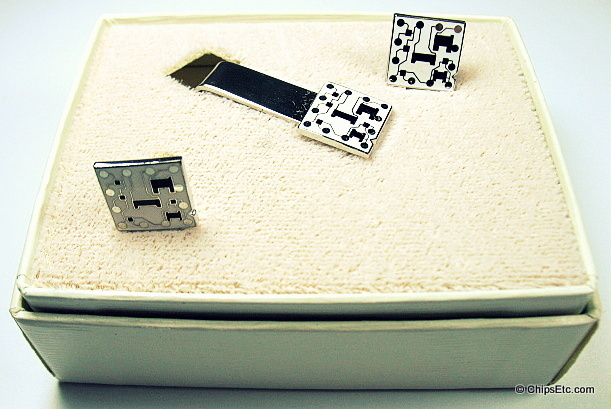 This a another high quality three piece Tie Bar & Cuff Link set resembling IBM System 360 Solid Logic modules. 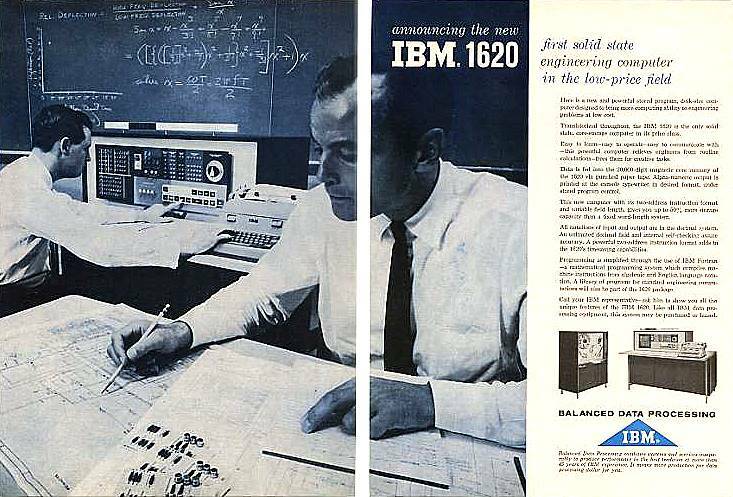 The men of IBM in the 1960s and 70s were famous for their tailored conformity, enforced by a strict dress code. This was how they had fun. 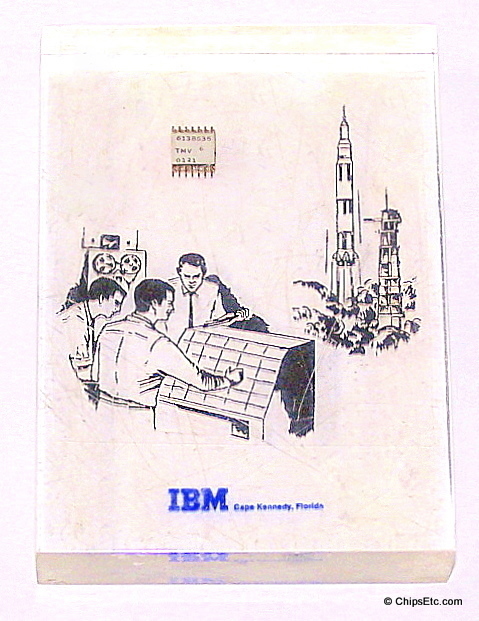 The set here came from the estate of a man whose decades-long term at IBM began in the mid 1960s. 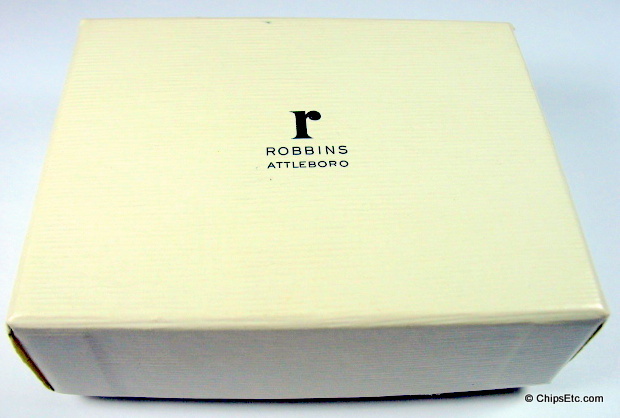 These were produced by the Robbins Co. of Attleboro Mass. 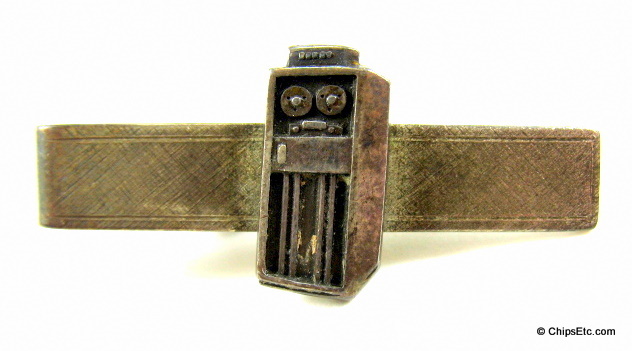 which was a manufacturer of military medals and other logo items for men. 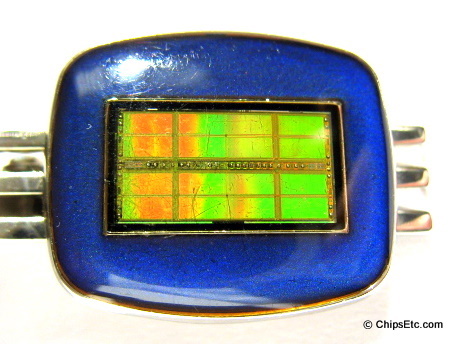 Features polished metal mounts with white enameling. 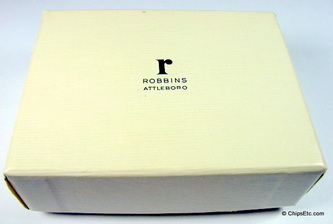 New, comes in original gift box.